It seemed like an ordinary morning, with the lecture on Drosophila genetics due to start at 8 o’clock. But when the professor walked in something remarkable happened: instead of starting the lecture right away, he posed an unusual question: “One of the students of this class has a publication on this topic. George Streisinger, where are you?” But the student he was looking for was not there – he slept in. Lotte Sielman, sitting in the audience, was just as puzzled as her classmates about the curious incident. She could not have guessed that George Streisinger would soon become her husband and would contribute a number of exciting and important chapters to the history of modern molecular genetics. Not to forget, the other author of the above mentioned Drosophila paper was one of the giants of the 20th century biology, Theodosius Dobzhansky. And if we look at the later works of Streisinger, this is not even unusual: being one of the most talented geneticists of his era, he built strong friendships and professional relations with almost all of the celebrated biologists of the 1950s. The Streisingers lived a typical upper-middle-class life. A family cook and a maid helped with the housework, but also took care of Gyuri – perhaps this was the origin of Streisinger’s later fondness for culinary delights. He was an omnivorous gourmand, who was ready to prepare or taste any kind of food. Well, almost any: kohlrabi was the exception. He hated it as a child, but if he did not eat it for lunch or dinner, it was back on his plate next morning. The little boy was diagnosed with a heart murmur at an early age, which prohibited him from taking part in the PE classes or playing soccer with his friends. Instead, together with Ervin, they went out to catch butterflies in the mountains of Buda. These early voyages as a budding amateur naturalist became the inspiration for his later career. His attraction to natural sciences would have been supported by the teachers in the Fasori School, however the turbulent history of the 20th century did not let this happen. 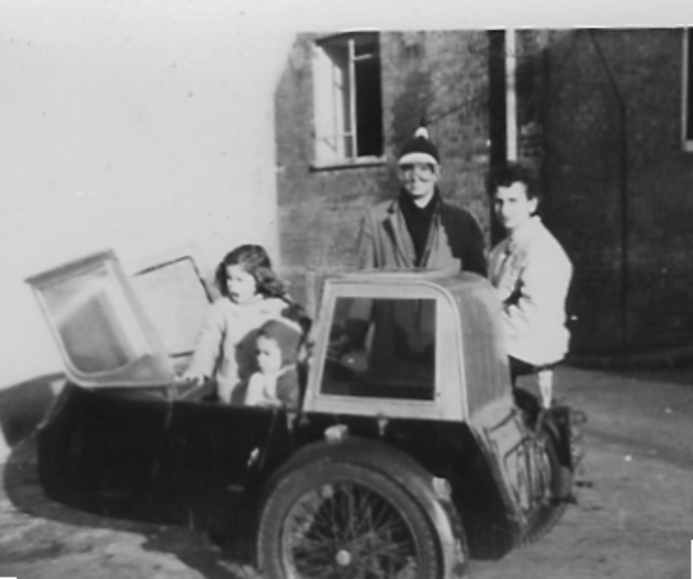 After a few months in the famed institution, the increasingly severe discrimination against Jews forced the family to pack up and leave everything behind for a better life on the other side of the Atlantic. 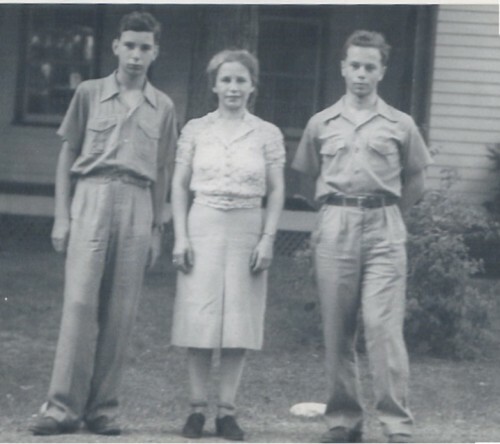 Margit Freund and her sons George (on the left) and Ervin (on the right) a few years after their immigration. (Photo courtesy of Cory Streisinger). They were not jumping in the great unknown, though. Margit’s two siblings, Fred and Viola have fled Hungary several years before, and they had already established a new life in New York. Fred worked for the General Oil Burner company, while Viola married a dry-cleaner, Anthony Burachio. Margit visited them in 1936, although probably she did not really expect to join them as an immigrant in a few years time. Finally, on March 1939, the USS Manhattan arrived from Le Havre to Ellis Island, with the missing members of the family on board. The reunion, sadly, was not the happy meeting they had all hoped for. By this time Andor was quite sick, with metastasized gut cancer that spread to his spine. He was hospitalized the next day and in less than two months he died in the Long Island College Hospital. The freshly widowed Margit Freund found herself with her two children in the middle of a huge and unknown metropolis. Erwin was able to look after himself, first as an employee in a tailor shop, but after a few years of college he enrolled into the Army. Margit and his younger son stayed for a few months with their relatives, and later moved to the 87th street. The mother, with the help of her sister found jobs as a dry cleaner and tailor. The housework was all left to young George. George mastered English extraordinarily fast, and just in a few years time, after taking one of the most competitive entrance exams in the city, he got enrolled into The Bronx High School of Science. Here, perhaps due to the earlier inspiration of the trips to the Buda mountains, he joined the Herpetology Club, which organized collecting trips to the Pine Barrens of New Jersey. His fondness for natural history was so obvious that he was soon hired by one of the fish experts of the New York Zoological Society, Dr. Myron Gordon. (The fish experience will become an important point of reference in Streisinger’s later life.) He relished working with Gordon, and due to his enthusiasm, after finishing high school, on the summer of ‘44 he got the opportunity of a lifetime: to work with Dobzhansky in the latter’s Columbia laboratory. The joint work resulted in the aforementioned paper, which was published in the Proceedings of the National Academy of Sciences. Dobzhansky was fascinated about the possible role of sexual selection on the evolution of species, and the work of Streisinger was key to understand this. Young George has spent the summer with pairing males and females from different populations of a South-American Drosophila species to find out whether they attracted each other or not, by dissecting the females. As far as we can tell the renowned naturalist soon became more than a simple mentor for Streisinger, and he acted more like a father, taking the boy to his family holidays to California. 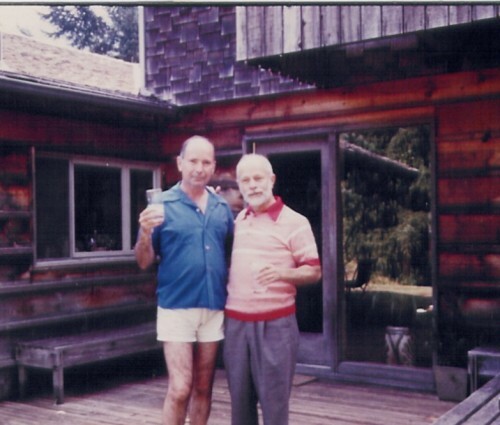 But the most important influence on George’s life was his extended professional network: Dobzhansky helped Streisinger to gain access to Cold Springs Harbor, the cradle of modern molecular genetics, which became the defining moment in the young scientist’s life. In the fall of 1944, aged only 16, Streisinger enrolled to Cornell University’s School of Agriculture. This might sound as an odd choice, but unlike other schools at Cornell the School of Agriculture was free to attend, with the small caveat that students had to spend some of their time with farmwork. And in the financially precarious situation faced by the Streisingers this was the only way George could actually enroll to the prestigious institution. Even this way he had to find other sources of income to get by: he worked regularly in the local coffee shops, and later tested the bacterial content of fresh milk in the Dairy Department. Ironically, the small caveat about the farmwork almost wrecked Streisinger’s career: while his classmates accomplished this work during the summer break, he was too busy toiling away in the laboratories of Cold Springs Harbor. And while this summer work helped him enormously in his later career, at Cornell he was forced to postpone his graduation and worked at a farm, shoveling manure during the coldest winter of the decade (something that made him proud even years later). Being a staunch pacifist, he also refused taking part in ROTC sessions, a decision that also contributed for his delayed graduation, but finally in the summer of 1950 he received his degree. The Sielmans arrived to the US in 1938 also escaping the deportations of nazi Germany. Lotte and George found out soon that they had a lot of common, and after the first date they became an inseparable couple. They went together for bird watching in the morning, and in the spring their night rendez-vous often ended in the nearby marshes, where they observed the mating rituals of salamanders and frogs. They married in 1949, the day before Lotte’s graduation. A good friend was playing their favourite tunes on the bells of the chapel, and the wedding party was hold in a teacher’s garden, where an accordionist provided the music. The aftermath of the two atomic bombs, dropped after Germany’s capitulation (when most considered the war to be effectively over) caused serious soul-searching for many physicists working for the Manhattan project. Many considered the bombing unnecessary, a cynical exercise of power that was intended to send a message to the Soviet Union sacrificing tens of thousands. Many scientists turned away from physics for good and searched for other research topics. Influenced by Erwin Schrödinger’s essay, ‘What is Life?,’ for many of them biology would provide the next frontier. In his highly influential little book, Schrödinger tried to explain how simple physical and chemical reactions could explain the behavior of biological systems. One of the key problems, identified in the essay, was the nature of genetic information. No one understood at the time how this information was encoded on a molecular level (Schrödinger posited the existence of aperiodic crystals), and the book clearly catalyzed efforts to reveal this great unknown. Bacterial and phage genetics dominated the coming decades and delivered results (often followed by Nobel prizes) at an astonishing pace. Phages played a central role in demonstrating that DNA is the molecule of inheritance. Alfred Hershey’s and Martha Chase’s experiment complemented beautifully the bacterial work started by Frederick Griffith and finished by Oswald Avery. And while after Avery’s results there were still some who were adamant about the role of proteins in inheritance (DNA was considered just “too boring” to play such a central role in biology), the Hershey-Chase experiment silenced all the skeptics. Hershey, together with two other colleagues, Salvador Luria and Max Delbrück (themselves immigrants, just like Streisinger), also founded the legendary “Phage group”. During the 1940s they organized summer courses at Cold Springs Harbor, and the list of attendees now reads as who-is-who for the molecular genetics of the 20th century. 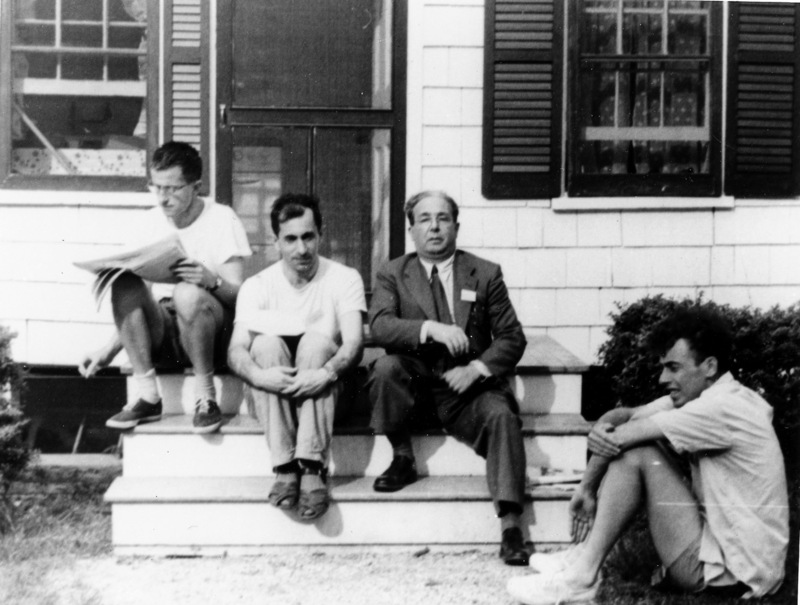 Seymour Benzer, Sydney Brenner and James Watson were amongst the first to come to CSH, as was Leo Szilard who also became interested in biology at the time. And amongst all these luminaries there was also George Streisinger. Luria and Delbrück escaped the fascist and nazi regimes by emigrating to the US, where they soon became central figures of molecular biology. (Together with Hershey they received the Nobel prize in 1969 for their pioneering work). After a short detour at Columbia, in 1943 Luria started to work at the University of Indiana, where his first PhD student was Watson himself. The same year, in a series of inspired experiments, Luria and Delbrück demonstrated that mutations arise spontaneously in bacteria (something that was far from trivial in an era when many even questioned the existence of genes in prokaryotes). The summer courses at CSH had a profound influence on the young Streisinger, and after finishing at Cornell, he started a PhD in Luria’s group. Probably equally importantly his friendships from the Phage group provided him with a fantastic social network for the rest of his life. Streisinger followed Luria to the University of Illinois, where finally he could reunite with his wife. According to Lotte’s memoirs, this was also the time when George became involved in progressive political activism. He pursued this activism with a characteristic passionate rationalism till the end of his life. This was the time when he became deeply involved in the fight against desegregation – with motivated activist friends they provided evidence that in several neighbourhoods landlords choose renters based on skin color. After receiving his PhD, George moved to California for a postdoc in Max Delbrück’s group. It wasn’t so much the research topic that attracted him to the West Coast as the realisation that everybody who counted in molecular genetics those days had gone through the Delbrück and Pauling labs at Caltech. During these three years (1953-1956) the family also expanded: soon after their arrival Streisinger’s first daughter, Lisa was born at the Pasadena Clinic, soon to be followed by Cory. Streisinger’s research project at this time was to establish an experimental system for plant viruses, akin to the one that was already used for phages. The work progressed slowly, and in spite of the many experimental failures he established a fruitful barter system with his office roommate, Harry Rubin. Working with Rous’ Sarcoma Virus Rubin used chicken as his model, which complemented (in the kitchen, that is) very nicely the coconuts of Streisinger (used for their milk), thus for several weeks the Rubin and Streisinger families ate copious amounts of coconut chicken. This wasn’t the only extravagant gastronomical experiment, in which George took part at the time: during New Year’s Eve parties he cooked suckling pig in the departmental autoclave. Finally, by the time everyone was fed up with chicken and coconuts, George, frustrated by the experimental failures, turned back to work again with phages. This led him to his first appointment, back at his alma mater, Cold Springs Harbor. Thanks to the fame of the Phage group, by this time CSH has left behind the stigma of eugenics for good and became the Mecca of molecular biology. After the slow and quiet winter months the summer always brought in new people from all over the world, eager to collaborate with the local scientists, or to attend the Phage course. By this time, instead of the original Delbrück-Luria-Hershey trio, the course was taught by the resident researchers, including Streisinger himself. The closing ceremony for one of the later Phage courses. Frank Stahl can be seen on the left and Geroge Streisinger on the right. The three idyllic years at CSH were interrupted by a sabbatical year that the family spent in England. George was invited by Francis Crick to spend some time at the famed Cavendish Laboratories, together with Benzer and Brenner. Cambridge had a bubbling social scene at the time, with an endless number of programs and parties, often organized at the Crick’s home, “The Golden Helix”. During their stay Benzer, Brenner and Streisinger came to agree that the English kitchen in the 1950s was awful. After his arrival Benzer suggested Crick that they should try out every day another restaurant, however soon they realised that in the absence of quality places the exercise was futile. Therefore, when a month later the freshly arrived Streisinger enthusiastically suggested the same thing, he was just met sarcastic laughs. But George did not give up the hope to eat quality food, so soon together with the Benzers and Renato Dulbecco they started a gourmet dinner-club. They went to great lengths to get the best local venisons – George once traveled to Yarmouth to by fresh clams for a dish of moules marinière. In the end the members of the dinner club were spending almost as much time with preparing meals as doing actual research. Back from England Streisinger started looking for a new job, and the first offer came from Brandeis. It offered everything George needed, yet neither him, nor Lotte felt enthusiastic about the poshy Boston suburbs that were hard to square with the progressive worldview of the Streisingers. However, while considering Brandeis an irrefutable offer came from Aaron Novick, the freshly appointed director of the Institute of Molecular Biology (IMB), in Oregon. Novick asked Streisinger to join him, to become one of the “Founding Fathers” of the new research center. Novick graduated as a chemist in Chicago, where he was promptly recruited to the Manhattan project in 1943. This is where he met Leo Szilárd, who became soon a mentor for the young scientist. As for many fellow scientists, the detonation of the atomic bombs over Nagasaki and Hiroshima caused immense consternation and soul-searching for Novick. He wanted to get out of nuclear research as soon as possible and also became an ardent supporter of nuclear disarmament till the end of his life (for many years Novik edited the Bulletin of Atomic Scientists promoting a pacifist worldview). The change in career was facilitated by Szilárd’s invitation to join him in attending the phage course at CSH, or in other words to join him for “an adventure in biology”. The opportunity excited Novick, who saw in it a chance “to exchange death for life”. 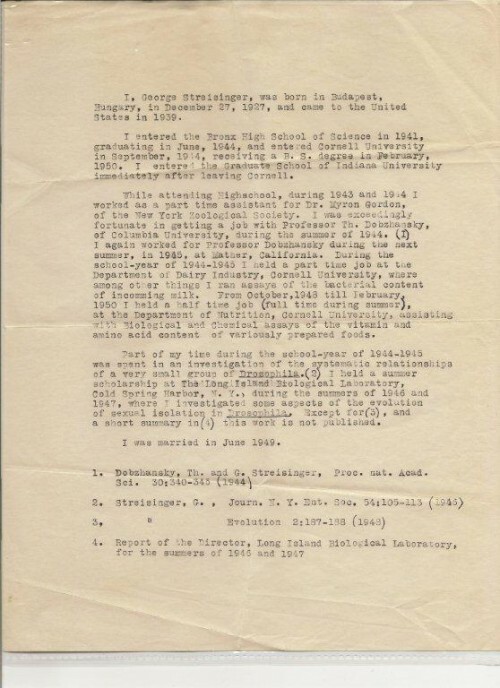 After the war Novick returned to the University of Chicago, where in 1959 he got the offer from University of Oregon to become the director of the freshly minted IMB (as the story goes, this was the first institution with “molecular biology” in its name). He also got a free hand in selecting his coworkers, and this is how he met Streisinger, who was suggested by a former colleague, Frank Stahl, himself a new IMB fellow. Eugene, the home of IMB, and its surroundings enchanted the Streisingers who accepted the offer almost immediately. Soon they were settling into a small loghouse, close to the city. The new house and the nearby barn became the home to a number of animals as well, and George took great pleasure in his Nubian goat herd. This actually brought him fame, and soon he spent several weekends every year acting as a goat judge at different country fairs. The idyllic life had a positive impact on George’s research as well. At IMB he continued his phage research, and his new results were getting the acclaim of his peers. This is demonstrated by a recommendation letter that Watson wrote for him when George was applying for a promotion: “George Streisinger is now one of the most productive geneticists in the United States. The work of his group at Eugene on the circular nature of the T4 chromosome is first rate. 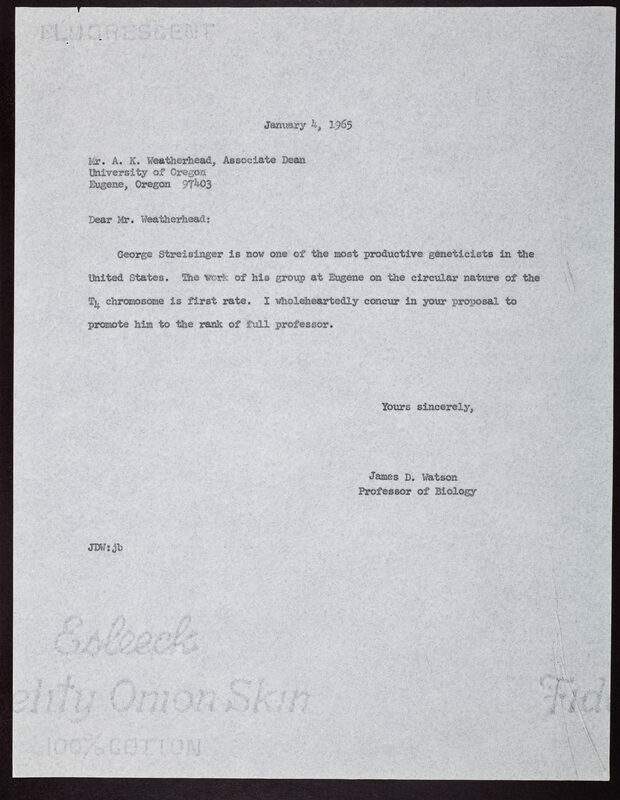 I wholeheartedly concur in your proposal to promote him to the rank of full professor.” The same esteem can be found in Streisinger’s correspondence with Francis Crick, where they discuss some of George’s more recent results that contributed to the deciphering of the genetic code, but also recognized that mutations at repetitive DNA sequencing are due to the stuttering of the polymerase, a phenomenon still recognized as ‘Streisinger slippage’ in the literature. The more collaborative and much less competitive spirit of the era is also demonstrated by the fact that while Streisinger happily shared his data at conferences and private correspondence, he was much slower in writing them up into formal papers. This was the reason why at an IMB jamboree he was presented with “Doctor of Delayed Publications” honor. However, the greatest gap in his publication record in the 1970s was not due to his tendency to procrastinate, but because of his desire to “do something big”. And this was nothing less then establishing a new vertebrate model organism. Accordingly, some of the biggest names decided to leave the crowded phage-field and started pioneering work to find other model systems. Seymour Benzer started to study the nervous system of the fruitfly, whereas Brenner elevated a simple nematode, Caenorhabditis elegans, to the pantheon of genetic model organisms. 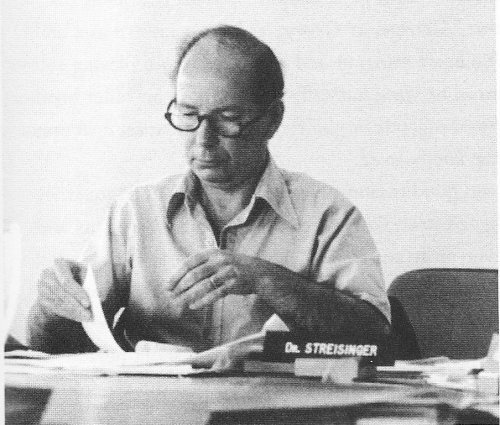 Streisinger was also enthusiastic to change, but unlike his friends, he firmly believed that due their individual characteristics non-model organisms will be only of limited use in understanding and studying the complex nervous system and behaviour of vertebrates. To understand vertebrates, one needs a vertebrate model, and that is how zebrafish came into the picture. Truth to be told, it wasn’t Streisinger who first used the zebrafish as an experimental organism. This honor most likely goes to a researcher at Wayne State University, Charles W. Creaser. Back in 1934 Creaser already argued that this little fish from Southeast Asia, a favourite of aquarists all over the world would be a suitable model to study embryology. Its small size, external fertilization and fast development make it an ideal model species for vertebrate developmental biologists. During the next couple of decades zebrafish research progressed at a slow space, with an occasional paper here and there. But at this time, it was only one of the many bony fish species that were used in research (and its relatives, goldfish and carp were far more popular). Nothing suggested that soon it would have a prominent role in biology. The university provided a World War II quonset hut to facilitate the new project. This is where Streisinger and his assistant, Charlene Walker worked out the standard conditions for maintaining and breeding zebrafish. As the hut became overheated during the summer, and too cold during the winter, the biggest challenge was to provide constant temperature. Against the heat they sprinkled water on the surface of the hut, whereas during winter dozens of electric heaters were installed (and often got short-circuited in the humid environment). Yet the problem of the temperature was easy compared with the headache that parasites caused to the experimental duo. These wiped out fish tanks again and again. In order to fight them, George and Charlene started to add more and more chemicals to the water. These restrained the parasites, but also interfered with fish development. Finally, after many trials and errors, Charlene was able to standardize the conditions, and George could start with the real experiments. As he put it in a 1974 NSF application, his goal from the beginning was to “study features of the organization and embryological development of the vertebrate nervous system through the use of mutant strains. [He was] particularly interested in the mechanisms leading to the formation of specific synaptic connections and in the nature of the signals that guide specific axons to particular target sites.” He wanted to create mutants with nervous system abnormalities, but in order to create homozygous animals for rare mutations he had to overcome their diploidity. A huge advantage of the worm, C. elegans, is that most of the individuals are hermaphrodites, capable of self-fertilization. This makes them well suited to study recessive mutations. Although hermaphroditism is almost nonexistent in vertebrates, there are quite a few examples for parthenogenesis, which also makes the analysis of mutations much easier. However, zebrafish is not one of the parthenogenic species. Streisinger, obviously, was aware of this, but he was convinced that he could find a way to jump start the development of unfertilized zebrafish eggs, thus in effect making them parthenogenic. After a few abandoned trials George and Charlene figure out the right conditions for the procedure, and they started producing mutants with vigour. The first results were published on the frontpage of Nature in 1981, and a new science was born: zebrafish genetics. 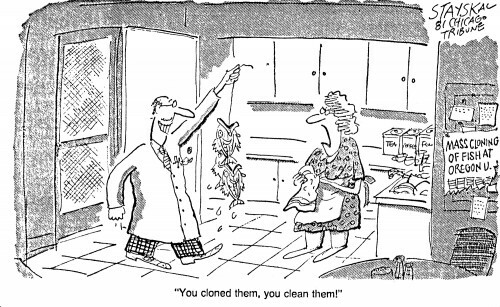 The first zebrafish clone aroused the interest of the general press, exemplified by the cartoon of the Chicago Tribune. In one of the many interviews he said: “We’ve developed a vertebrate system for doing interesting genetics. It just hadn’t occurred to us by any stretch of imagination that our work would generate any of this… There is a general worry among scientists, that overuse of cloning would lead to a loss of variety in food crops, but almost anything could be misused so it is very difficult to know at the time whether the good you get out of something will outweigh the bad.” He considered human cloning at the time unrealistic, but he also said that he had much greater, immediate worries. “I see the danger of global nuclear war imminent. The use of poison warfare, the widespread use of chemicals that may be hazardous, the lack of any serious attempt to deal with population growth, the lack of any real concern about just incredibly unequal distribution of wealth.” These were all things that should have been more important for newspapers than zebrafish cloning. After the University of Illinois years Streisinger never stopped to be civil rights activist, and the atmosphere at IMB was very supportive for this sort of activities. Novick’s campaign against nuclear proliferation was only the most prominent of the campaigns originating within the walls of the institute. IMB researchers became important allies of EPIC (Eugene Peace Information Center), and none of them was as vocal as Streisinger himself. He became the local representative of the national Turn Toward Peace lobby group, but his major contribution came in the fight against toxic herbicides. In 1962 Rachel Carson’s “Silent Spring” successfully focused the attention of the public to the potential health hazards of agricultural chemicals. The book that ushered the creation of EPA, was drawing attention to the hazard of DDT, but it was obvious from the start that there are many other potentially dangerous pesticides. In the Oregon woods the local Forest Service used dioxin-based chemicals against weeds, and this unsettled the locals. Many of them were afraid that these chemicals (all related to the infamous Agent Orange) could accumulate in the plants and get into the groundwater. EPA originally concluded that there was no reason to worry, but many were unconvinced. They asked IMB researcher to help to prove that dioxin is toxic and dangerous. Streisinger became the star witness of the trial, and argued successfully that in the case of dioxin there is no such thing as “safe dosage”, as even at very low concentrations that chemical causes chromosome breakage, thus it must be mutagenic. The judge accepted this, and ordered the EPA to perform new, systematic studies. These, in turn, lead to the banning of dioxin-based herbicides in a few years time. Streisinger’s opinion carried weight, because as a geneticist he studied often the mutagenic potential of different molecules. These observations were important not merely as toxicological observations (although, undoubtedly, zebrafish is still an important model in toxicology). George wanted to understand how mutagens work, so he could use them in his project to create mutant fish lines. Besides research and civic duties, George took teaching extremely seriously as well. Usually he started his lectures at 8 am, so he could do experiments the rest of the day. But even after several decades of experience he still worried how the students will receive the material, thus in order to get well prepared, he woke up at 4. His methods of teaching were way ahead of his time: one could easily think the Dance your PhD competition is something original, a creative 21st century idea, yet four decades ago Streisinger collaborated with the local Dance Department to illustrate his lecture about protein synthesis. By the early 1980s as the founder of a zebrafish research, Streisinger was becoming one of the star researchers of IMB. His efforts were not only recognized by his peers (by this time many other IMB groups started to work with fish), but also by the wider public of Oregon. However, as the IMB was preparing to celebrate it’s 25th birthday a tragedy happened: on 11th August 1984, a few weeks before the ceremony Streisinger died during a scuba diving exam near the Oregonian coast (that old heart murmur never disappeared completely). The IMB birthday promptly became a Streisinger memorial. It was attended by the very best of the 20th century molecular biology. From Hershey to Watson they all wanted to pay their tributes. Without its father, the future of zebrafish research became in peril. It was up to the IMB colleagues to carry the torch, and they promptly did so. Thanks to their work as well, today it is obvious that zebrafish fulfilled the expectations. It became one of the most widely used genetic model organisms, used as much to study simple developmental processes as to model complex human disease. But the thousand or so zebrafish labs around the world today exist only because of that one quonset hut in Eugene, where George and Charlene heroically worked out the basics of zebrafish research. Although Streisinger emigrated at a very young age, he never completely forgot where he came from. The recipes of Hungarian pastries were always held in high esteem in the family cookbook, and with Margit and Erwin George they always spoke Hungarian (after many decades he still spoke English with a characteristic Hungarian accent). Yet, we know of a single occasion when he visited Hungary after 1939. In the 1960s he arrived to Budapest for a lecture, together with Frank Stahl. The visit was a good opportunity to revisit his city of birth and meet some relatives. As Frank Stahl remembers, they walked a lot on the banks of the Danube, ate in small restaurants, and Streisinger was fond of recalling his memories of Gellért bath. At the lecture George was adamant to speak in Hungarian, but probably his mixed accent and the topic that was completely novel to his audience (biology in the Eastern bloc was still under the influence of lysenkoism) just confused the people in the room. So in a few minutes time he was asked to continue in English. To write this post I relied heavily on Lotte Streisinger’s book “From the sidelines”, Jim Endersby’s “A Guinea Pig’s History of Biology” and Errol Friedberg’s “Sydney Brenner – A biography”. Some facts were also taken from George Streisinger’s autobiographical essay, “Terminal Redundancy: All’s Well That Ends Well”. I am extremely grateful to Cory Streisinger for sharing the countless family stories and photos. I also want to thank Frank Stahl, Ferenc Müller and Julianna Vig for helping me with this story. Photos are used with the permission of the Streisinger family and Cold Spring Harbor Library. Thank you for posting this, it is a delightful history. I agree. Thank you. I learned a lot of new details about Dad’s life. Thanks so much for posting this bio of George Streisinger. I’ve been studying the growth of zebrafish research looking at patterns of collaboration and acknowledgements in the early years–and this bio gives me a much fuller understanding of the beginnings of the field and the research culture at the U of O. Thank you for the story! love it! 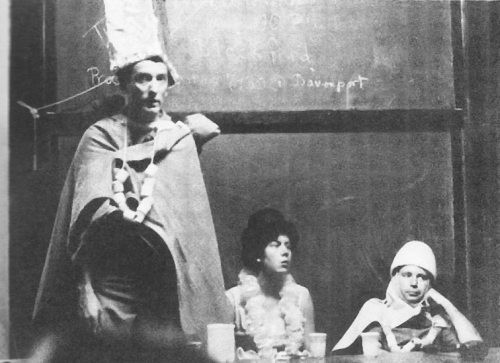 He invited the entire 100 level UO biology class to his home to act out the replication of DNA, about 1974. This is so fascinating and valuable for those of us here in Eugene,Oregon who knew George Streisinger as the kind and imaginative and thoughtfully socially conscious citizen he was. A friend to all. He was active/supportive in the 1960’s-’70’s peace movement community and was always such a positive, welcoming person who would stop for long chats. I remember one especially wherein he stopped for a spell and I had mentioned an interest in visiting Hungary;he spoke with an enthusiastic glow of happiness of the beautiful features of Budapest, suggesting that I stay at the Hotel Gellert (which I have yet to do, hoping to visit Hungary one day); he reflected an enduring love for his native city of his youth-before the impending horrors of WW I and the flight for a new and safe lifew for himself and family. The one feature I remember about George was his affectionate accent, his smile, good humor and curiosity, coupled with a tender love for his spouse Lotte and their children. he was an unforgettably decent and compassionate person. How he has been missed. This is so fascinating and valuable for those of us here in Eugene,Oregon who knew George Streisinger as the kind and imaginative and thoughtfully socially conscious citizen he was. A friend to all. He was active/supportive in the 1960’s-’70’s peace movement community and was always such a positive, welcoming person who would stop for long chats. I remember one especially wherein he stopped for a spell and I had mentioned an interest in visiting Hungary;he spoke with an enthusiastic glow of happiness of the beautiful features of Budapest, suggesting that I stay at the Hotel Gellert (which I have yet to do, hoping to visit Hungary one day); he reflected an enduring love for his native city of his youth-before the impending horrors of WW II and the flight for a new and safe life for himself and family. Thank you for sharing. What a kind, compassionate human who had such love for his amazing wife Lotte. Eugene , Oregon is a better place because of Lotte and George.